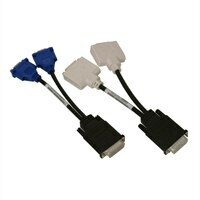 Dell DMS-59 to dual DVI / DMS-59 to dual VGA (Y Cable Kit)The Dell DMS-59 to dual DVI / DMS-59 to dual VGA (Y Cable Kit) from Dell™ will help you connect your graphics card to your Monitor. This cable will help you achieve high-resolution images and picture-quality. This easy-to-use cable enables you to keep your workspace organized, manageable and free of cable clutter. This product ahs been tested and validated on Dell systems. It is supported by Dell Technical Support when used with a Dell system. The Dell DMS-59 to dual DVI / DMS-59 to dual VGA (Y Cable Kit) from Dell™ will help you connect your graphics card to your Monitor. This cable will help you achieve high-resolution images and picture-quality. This easy-to-use cable enables you to keep your workspace organized, manageable and free of cable clutter. This product ahs been tested and validated on Dell systems. It is supported by Dell Technical Support when used with a Dell system.